NCCO provides multigenerational, multi skills level instructive rehearsals throughout the year. We take a noncompetitive, low stress approach to help overcome the fear involved in initial participation, particularly for older adults coming back to music after many years of inactivity and as up-and-coming youth from the String Education Program become ready to participate. Additionally, members meet in sectional practices weekly on their own for additional mentored learning sessions. 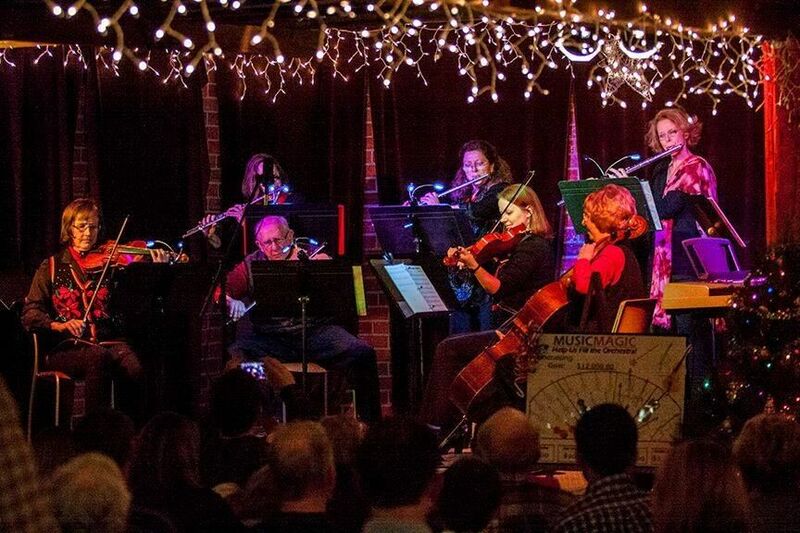 Full orchestra concerts....During our concert season running from September through May, our orchestra is under the direction of a conductor/ music director. We hold three to four sessions of rehearsals for 8 – 10 weeks with new music pieces for each set culminating in a free community concert. Concerts feature a variety of classical, popular, movie theme and original works. All NCCO concerts are designed to be free, entertaining, and educational music experiences open to the general public of all ages. Concerts are held at the Rockfish Valley Community Center as well as other community venues throughout the county and area to allow easy access to everyone in our community, including those in assisted living/retirement or nursing homes, schools, churches, and senior centers. Wandering Minstrel performances ... for those of us who "can't get enough", we take our show on the road and perform outreach and benefit performances, like this one benefiting the youth Music Magic String Education Program at Rapunzel's Coffee House in Lovingston.